Wondering about the Benefits of Having a Rooster in your flock. Chickens will happily lay eggs without a rooster, but a rooster does help keep peace among the hens. A rooster also takes on the task of alerting the hens when a predator its about. Roosters fertilise eggs which hatch into chicks. No Rooster equals no chicks. Chickens lay eggs without roosters. But to grow a chick the egg has to be fertilised. The most significant advantage of a rooster is they fertilise chicken eggs. No rooster equals no chicks. If you want more chickens, you will have to get a rooster. Otherwise, you’ll be begging or buying fertilised eggs. Having a rooster is a free way to increase the size of the flock. A rooster naturally protects the chickens. He watches for predators and sounds the alarm when there is a danger. He is the one who finds nice nesting spots. He may even watch and protect laying hens. He takes it upon himself to let the hens know where a good source of food is. Now, admittedly, in a backyard flock, hens are just as likely as a rooster to spot the scraps or a handful of mealworms. But the evolutionary instinct is still there and hens like having a rooster as a protector and provider. So much so that their contentment can produce more eggs. Chicken flocks have a rigid pecking order. Hens will fight brutally for their place and some hens are just plain bullies. Roosters, on the other hand, will usually not clash with the hens. Nor will they participate in bullying. Also, they frequently break up hen-fights. So while the answer to the question of "Do you need a Rooster to lay eggs" is no, you can certainly have a happier flock with a rooster. Although uncrowded hens generally get along with each, a flock with a rooster is usually more peaceful. There is less fighting for the top spot by the hens. Roosters are the natural leader because their physique is more muscular and substantial. If you watch hens which have a rooster in the flock, they tend to be more relaxed and less likely to indulge in bullying or fights. There is something special about watching a proud rooster foraging in the farmyard. His gentlemanly prowess as he woos the hens with dance is beautiful. When you conjure up the image of a rooster crowing on the apex of a barn, you think of a rooster announcing the first morning light. Now take that image and forget it — Roosters crow at all hours and for almost any reason. Roosters will crow, no matter what you do. It’s their instinct. So if you have small children or you don’t sleep well yourself a rooster might take a bit of getting used to. And if you have neighbours nearby who may not appreciate a midnight recital, a rooster mightn’t be for you. In urban and suburban areas, there are strict regulations about keeping chickens. These laws often determine how much land you need as well as how many chooks you can have. And in the interest of friendly neighbourhood relations and also urban noise pollution, they often also restrict the keeping of roosters. Before purchasing your Rooster check the local council to avoid unnecessary conflict or potential fines. Generally, show breeders keep breeding pairs. But in a backyard chicken flock, the ratio is usually six hens to one rooster. Less than that can lead to one hen being favoured. Feather loss on the hen's back and other related problems can occur. Try to keep the size of the rooster in proportion to the smallest birds in your flock. There’s nothing wrong with keeping a rooster in most mixed flocks. But if you have a significant discrepancy in the size of birds, it may cause problems. For example, a big Rhode Island Red rooster could cause serious injury to a bantam hen. If you want to introduce a rooster to a mixed-breed flock, consider getting a smaller breed. Then observe to ensure it doesn’t accidentally harm the smaller hens. Some customers have said they don’t keep roosters because they are mean to the hens. We agree. Some roosters take what they want without asking. However, nice roosters generally woo the hens. Once a rooster has chosen a hen, he will dance around her, cluck to her, as well as possibly present her with food. If a hen crouches for the rooster, she is indicating that she accepts the advances. Nice roosters rarely go after a hen that tries to evade them. 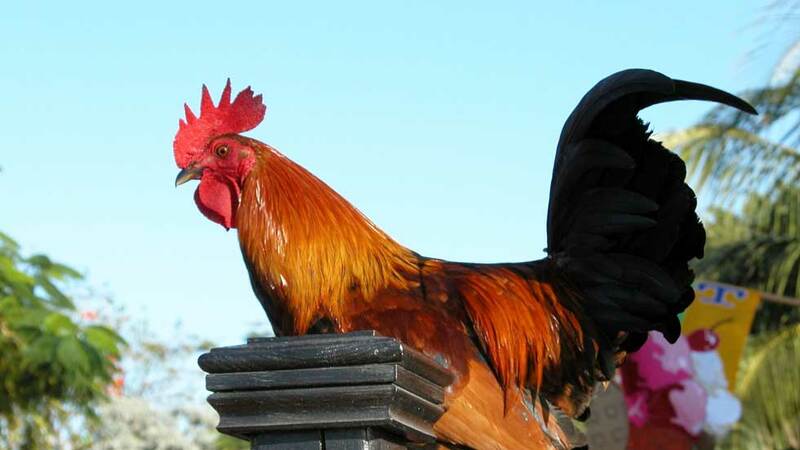 While it is unclear why some roosters are more chivalrous than others, it may be genetic. If you have ended up with an unkind rooster, think about replacing him with a Romeo-type for the hens. Also, in flocks with competing roosters, the roosters are less-gentlemanlike. They are trying to protect their territory as well as mate with as many hens as possible. The same may apply to roosters who are paired with a substantial number of hens. The feather loss is uncomfortable for the hen. It may also lead to feather pecking and eventual death. The best treatment for this damage is to remove the affected hen and treat the feather loss. If it continues to be an issue, get a chicken saddle to protect any suffering hen from the rooster’s claws. Keeping a flock with a rooster happy is pretty simple. Have one rooster and plenty of hens. Remove chicks that turn out to be roosters before they get big enough to upset the status quo, and ensure your rooster is a lover, not a fighter. If you still want a rooster and live in Australia, check out the options in our blog artlce Where can I Buy a chicken in Australia.